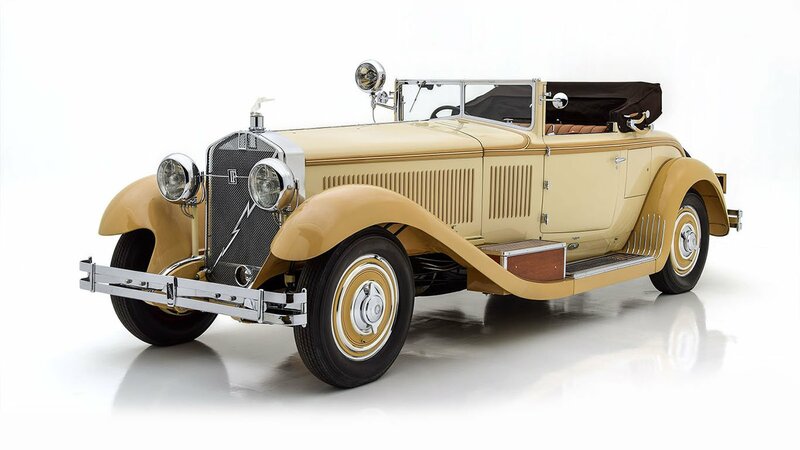 This 1929 Pierce-Arrow Model 133 wears gorgeous Dual Cowl Phaeton coachwork, one of the most exclusive and desirable of all styles available on the Model 133. 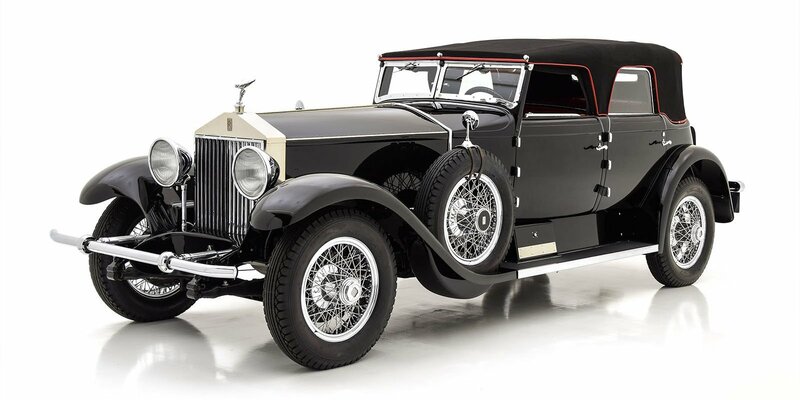 While Pierce-Arrow sales had doubled in 1929 with a total of 8,422 Model 133s sold, just 70 buyers would opt for this elegant body, which Pierce cataloged as the “Four Passenger Touring with Tonneau Shield.” This car comes to us via an extensive collection of Classic Era automobiles, and it benefits from a high-quality restoration which was completed in approximately 2007. 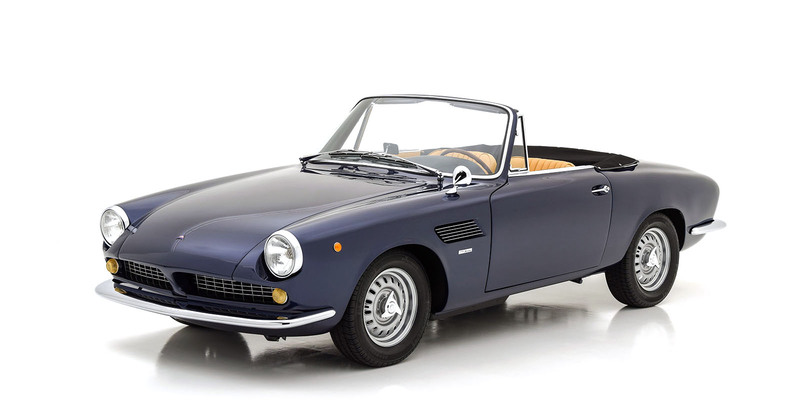 Since the restoration, the car has been driven and enjoyed on a regular basis, participating in various clubs events and shows around the country. 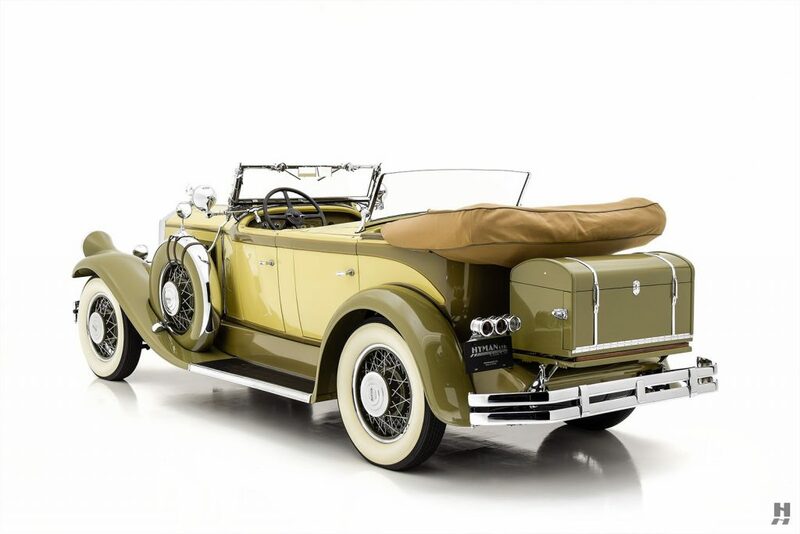 It won a First Prize at the 2012 National Pierce-Arrow Meet in Kalamazoo, Michigan and earned a class award at the 2017 Boca Raton Concours d’Elegance. 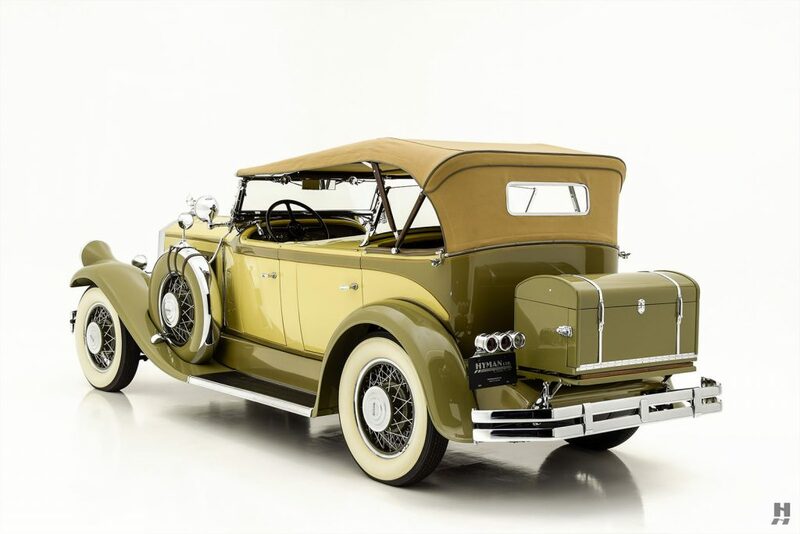 It is presented with a nicely mellowed restoration, in a handsome and distinct two-tone yellow-green over olive green combination, accented subtly with orange pinstripes. The paint quality is excellent, appearing beautifully-maintained while also displaying some light use. Bodywork and detailing are done to a high standard. 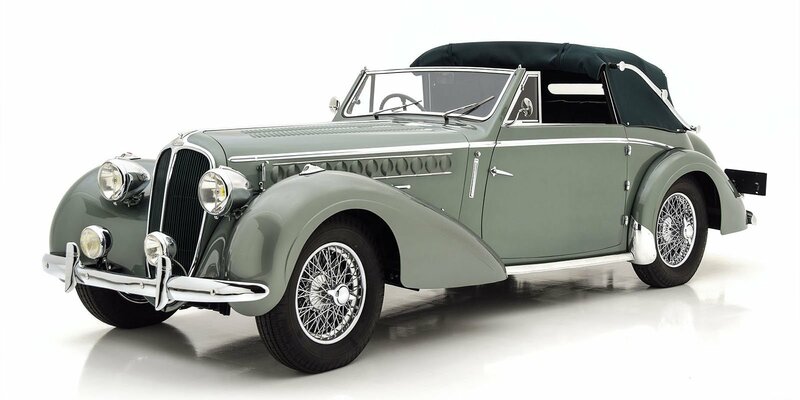 It is equipped with numerous options and accessories, including dual side-mount spare wheels with polished covers, dual Trippe driving lights, a radiator stone guard, and dual Lorraine searchlights. The famous archer mascot sits atop the chromed radiator shell, and out back there is a color-matched trunk complete with fitted suitcases. 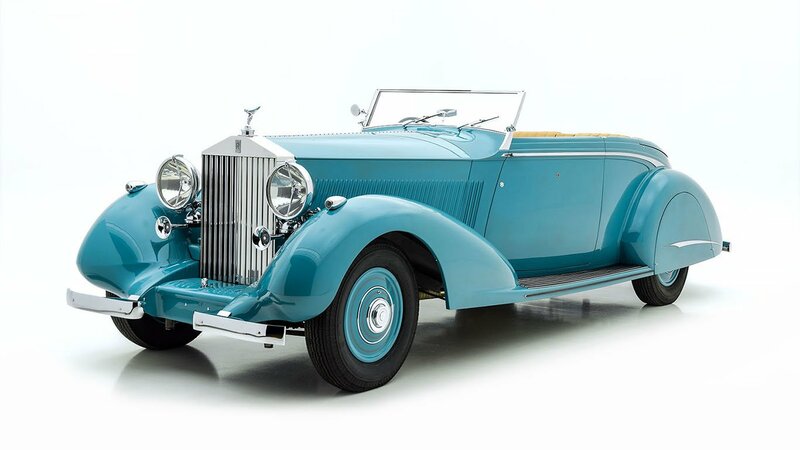 Plating on the accessories and fittings is excellent, and the optional wire wheels are finished with distinct painted rims and polished spokes for a distinctly sporty appearance. Inside, complementary gray-green leather features on the front and rear seats. The hides are in excellent condition, looking mildly broken-in and quite inviting. Carpets and door panels are excellent. 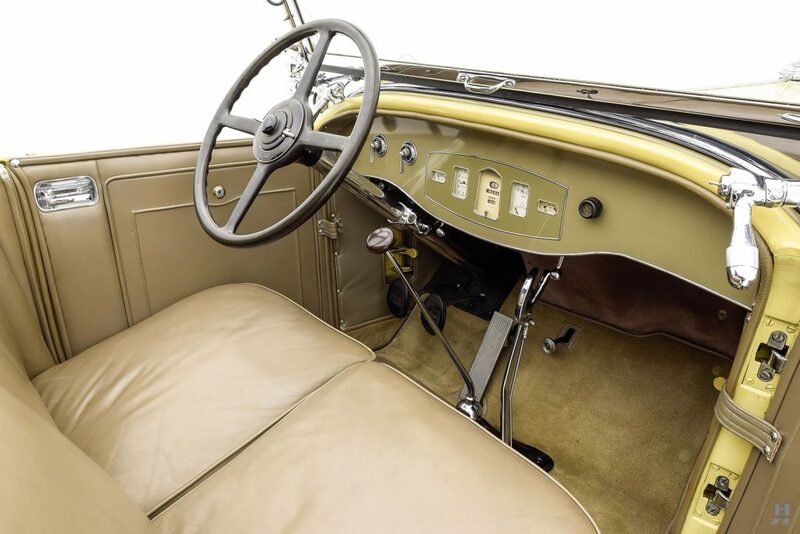 The cabin of the dual-cowl phaeton is sleek and modern, with a noticeable lack of wood trim and fussy detailing. 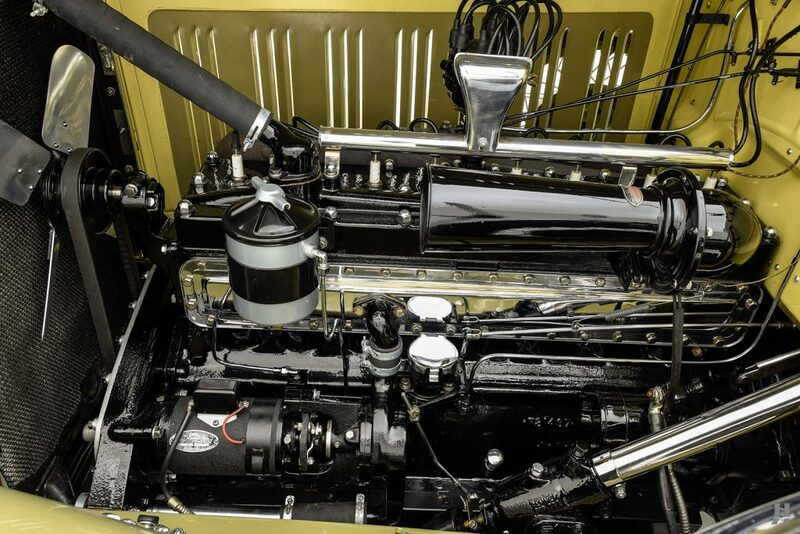 The dash is body color, with restored original instruments arranged in the center of the fascia. The folding top is made from high-quality tan Stayfast canvas, piped in leather to match the seats.